It’s a contest! Help me WIN and YOU win. Wow, have I got a prize package for you! Do we have any Alex P. Keaton fans out there? Children of the 80’s, you know who you are. 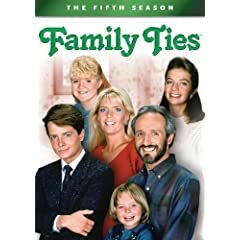 Did you love Family Ties as much as I did? Well, I’ve got the 5th season (1987) on DVD up for grabs here. Award-winning author Karen Wiesner is the founder of Jewels of the Quill, an award-winning group of authors in all genres banded together to promote their books. The group also does anthologies together. Woodcutterâ€™s Grim Series–Classic Tales of Horror Retold is a compilation of the first two novellas in the series that Karen contributed to Jewels of the Quill anthologies, plus two bonus stories in the series never before published! Also, a brand new Gladys Knight and the Pips CD–LOVE SONGS. Everybody needs love, Take me in your arms and love me, The look of Love, Help me make it through the night, and more. And, for a nice smell, I am throwing in a plug in home fragrance diffuser from Bath and Body Works. This is a warm apple pie scent that smells like you’ve been baking all day! Yum. And, because it’s not a good contest unless there is chocolate involved, I’ll be sure to throw in some chocolate for our winner, too. Now, what do you have to do to win this FABULOUS prize package? Here’s the thing. I’ve entered a “cute kids contest”, with the grand prize being a trip to San Diego. And you know how much I would LOVE to take my family to San Diego? Very much so, thank you. But in order to win, I need votes. Lots of votes! To vote for my sweet daughter, go here and click on “vote now”. Then vote for #43. 4- Press the vote button. 5- Check your email for your confirmation message. 6- Click the link in the email message you receive to verify your vote. 7- If you do not see the “circle” option buttons listed below, this means your vote has been entered or someone has already voted on your computer. Once you have voted, come back here and leave a comment. You can only vote once per email address, but if you have more than one email address, maybe you could vote again, and then come back and leave another comment. And if your husband or kids have their own email addresses on their own computer, wouldn’t that be wonderful to have THEM vote and then come back and leave me a comment. For 5 extra entries, blog about this contest! Your friends would like to vote for us, too, wouldn’t they? Then post a link to your blog post in a separate comment. Help spread the word– Help ME WIN and YOU win. Voting is open until June 29th, so we will close comments here on June 30th and draw from all the qualified comments for our prize winner. I voted but I didn’t get a “enter e-mail address” section. I hope it went through. I voted. Her picture is very cute. Some of the pictures weren’t very cute at all, but I didn’t look at all of them. Hope you win! I loved Alex P. Keaton so much! I voted for your picture! Thanks! I made the vote. Hope it helps. I voted at work – I’ll vote from home when I get there 🙂 I hope you win!